Just sharing a few photos from our Memorial Day weekend. We went outside of Leavenworth where our friends have a yert. We were able to park the camper into their very sloped drive-way (getting out was a bit more of a challenge but the mini-van came through, though it was in doubt for awhile). It was just a very low-key weekend spending time on the beach with good friends and peace and quiet. Well, except for our own kids, but it is nice to get away from the campground crowds, especially on holiday weekends. The hammock was a big hit for all ages. Lots more fun was had with a huge bon fire, smores, time at the lake and more. But I decided to step away from the camera for most of the weekend and just enjoy family and friends. I have found that is one positive to my Project 365. Instead of feeling like I need to document every little thing we do, I get a few good pictures for the day and than feel okay putting the camera away. And I just reminded myself that I all ready have scrapbooked layouts of us doing smores at the yert and other adventures there so I don't have to do it every time! As much as I love all our pictures, I think I sometimes am behind the camera too much and need to be more involved in the moment! The first and second graders at Madison's school had a musical performance last week. It was super adorable and such fun to watch. I am thrilled that they have such an amazing music teacher who goes above and beyond to put on a true performance. Such a great experience for the students! Madison was given the role of Little Miss Muffet with 3 lines she had to "perform". She did quite well with those but it was really the songs and actions that she enjoyed the most. Photo opportunities weren't the best as it seemed she was always getting blocked by somebody or something and the lighting was horrendous. And we even had the special front row seats that we purchased at the school auction (complete with cookies and lemonade, much to Nora's delight!). I am supposed to be getting a video copy from a friend and then am hoping to get some video snippets to share. Well, for preschool at least. We still have 4 more weeks before Madison is done. Nora had such a fantastic preschool experience and I am so glad that I decided to go with the one we did. I will admit that the parent co-op portion of it is alot more work than I would like sometimes, but the experiences that she got this year were so worth it. She can't wait for September when she gets to be in the red class. For the last day they had a carnival in the preschool. Mrs. Brown started out reviewing all their favorite songs from the year. Then one room had EVERYTHING removed from it (glad I wasn't on that assignment!) and cute little booths and stations were set up (face painting, snack booth, fishing, balloon pop....). Perfect for the 3 and 4 year old crowd. Not too overwhelming but tons of fun. Parents worked each booth and gave the kids prizes when they completed the task. I was in charge of the cake walk at the end and made these ADORABLE (if I do say so myself!) banana monkey cupcakes. The teacher had a monkey theme all year with name tags, stories to start the year, her Christmas gift to the kids..... so I thought it was the perfect end of the year treat. To finish the festivities we presented our kids with their preschool scrapbooks. Nora is loving hers and spends lots of time perusing it. "I have the best mom ever. I hit the jackpot. Any time there is any school activity it's just like DING and you are there with me!" I guess it is all worth it:-) I suppose in a few years it will be a bad thing that I am around the school all the time! I love the DING part, like a just have magical powers that sense a school activity is about to happen and I appear! She must not notice all the crazed scribbles on my calendar! The last few weeks have been a bit insane with all the school activities. Upcoming events: chairing the walk-a-thon committee for fall event, decorating the stage for the first/second grade musical and coming up with Madison's Little Miss Muffet costume, volunteer breakfast (hey an event where I just get to show up and not set up, organize, cook or clean for AMAZING:-), school carnival, teacher day at Jamba Juice and so much more. The calendar is hitting "black out" status. BINGO! Some days I wonder if it is all worth it or if I should be one of those parents who sit back and let it all happen as they watch. 1. That is NOT my personality and there is no possible way I would even know how to do that. 2. I realize it IS all worth it. Every minute I spend is valuable time that I truely believe is not only benefiting Madison but the entire student body. I am so thankful to be able to have the gift of staying home with my girls so I can be an active part of their daily education and Madison's comment makes me realize just how important it is! On the other side, many of you will be very proud of me for officially saying NO to something. I was approached about being the Board Chair (president) for Nora's co-op school. I was seriously considering it and was about ready to say yes when some switch (that I will probably never be able to locate again) turned on in my brain to say NO. Thank goodness. It helps that a great gal stepped up willing to take it on and I know there are so many great families at the co-op. I put in alot of time there but feel I am more needed at the elementary school where there aren't as many willing parents to help out in all the areas. Started the day sleeping in until 9:00 and then breakfast in bed with the newspaper delivered. Right there is a perfect start to the day!!! Then we loaded up and went to explore Discovery Park. It was a great time and we got lost on some back trails and had to navigate up and down some decent bluffs for the girls and the dog! We felt quite adventurous and I can tell this summer will be an enjoyable one for hiking with the girls getting older! No more backpacking them or attempting to get the Chariot onto trails. Luckily, Nora is still so petite that you can carry her for a time if needed. The perfect combination! We finally made our way down to the beach (the HARD WAY, found the easy way to get back) and the girls showed their love of the water once again, choosing to ignore lunch at 2:00 for exploring the tidal pools. Tom says you can tell they weren't born land-locked like their parents. We found this great starfish right out in the open, a perfect mother's day gift, the beauty of nature!! We eventually headed for home where I got to sit and watch the family cook calzones and apple crisp. YUMMY. And then I tested out my gift, a new bread machine! The photo should be of a full loaf of bread but the girls devoured it for breakfast and Madison insisted on my "homemade" bread for her lunchbox sandwich! The one bright spot to the backyard forest destruction is that we have sunlight in our yard now. It is still not a strong direct sun that you probably need to grow a proper veggie garden but we are giving it an attempt. I keep emphasizing to the girls that this is all an EXPERIMENT to try and not get their hopes up for a large crop. We leveled out one corner that had a decomposing tree in it to make room for the garden spot. I didn't want to spend much money in the construction of this garden, since the chance of success is a bit bleak. Tom quickly drew up plans for a hinged cover system to keep out rabbits, raccoons and the like along with building plans for a proper square foot garden (link to my friend Katy's great one!) But I was very hesitant to sink the money into this. So instead decided to go the recycling route. Tom built this great raised bed using some of the many fallen logs that we have collected in our yard. And how about this fabulous Purple Plastic Pool Pumpkin Patch?? Tom thinks it is atrocious and trashy, but I find it cute!! Then some old pots and planters from other parts of the yard that allowed me to justify purchasing new and prettier planters for the flowers! We have a little of everything to see what will grow. Peas, broccoli, strawberries, tomatoes, celery, carrots and cucumbers! Wish us luck, I think we need it. This past weekend's retreat was by far my most productive weekend ever. I even hit my "production goals" (Tom came up with that, are you suprised?) of 20 double page layouts in 48 hours!!! I really refined my organization technique and am thrilled with what I have come up with. It may not work for everyone but certainly worked for me. A few months ago I created my "Inspiration Binder". 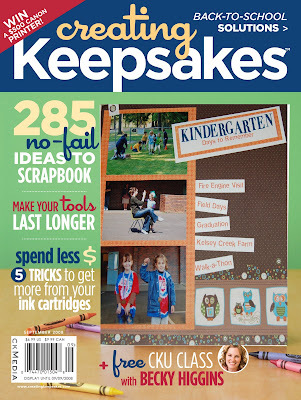 Every month when my cherished Creating Keepsakes magazine arrives in the mailbox I sit down and tear out all the things I love. It may be a layout, a photo idea, sketches or even just a quote. Then it all goes into sections in my binder. 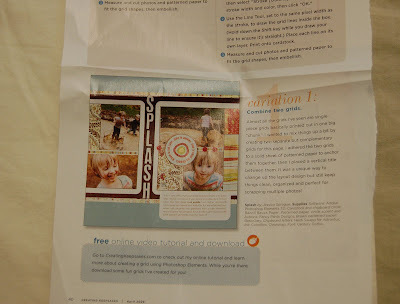 I also print out ideas I see on-line or any other inspiration areas. The binder is divided into sections for layouts, sketches, crafts, quotes and other. Okay, not really sure it is necessary to have this day of recognition. Pretty much an excuse for scrappers to go shopping and most scrappers I know, don't typically need an excuse to buy more supplies. As my friend Karin has said, "I am a collector, not a scrapper." I often feel that too. 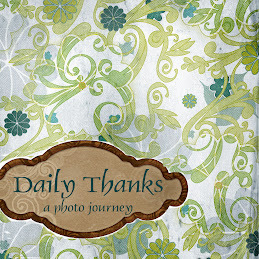 I won't be scrapping for this "holiday" but this blog has some great giveaways and downloads so I made this magazine cover using one of the pages I scrapped on my scrappin' get-away last weekend. I am hoping to share more soon! Kind of fun and it enters me for a give-away!! All give-aways are TODAY ONLY so check on over and get registered. A bit late in the day but better late than never! I had big plans to help the girls make adorable May Day baskets for the neighbors since they really enjoyed the activity last year. BUT the week got in the way so I was trying to let the "holiday" go by unnoticed but Madison remembered this afternoon and was adament they had to deliver something. Luckily the preschool plant sale orders arrived yesterday so I have 7 huge trays of plants/flowers in my driveway. So the girls left pony packs of snap dragons, zinnias, pansies and marigolds for the neighbors to plant themselves. The girls were thrilled and hopefully the neighbors will get them planted.